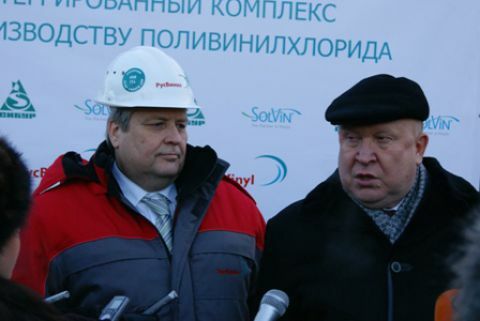 Today Valeriy Shantsev, the Governor of the Nizhniy Novgorod region attended with a working visit RusVinyl construction site in Kstovo Promzona, where the Company is implementing the construction of the integrated 330 kt/y polyvinylchloride complex. During the construction site visit the governor could personally evaluate the progress of the PVC Production Complex construction, which started in July 2010. At the moment several technical buildings including the buildings for the electrical substations are completed. The Governor also inspected the construction area where in November two pyrolysis furnaces were installed. The equipment is manufactured by a European company HEURTEY (France) and designed to produce vinyl chloride monomer which is a raw material for PVC. The weight of one furnace is 185 tons, the height is 50 meters. Two cranes with 220 tons lifting capacity were used to assemble and install radiant panels, convectional modules and stacks of the furnaces. The installation is planned to be fully completed next year. Guenther Nadolny, RusVinyl CEO noticed that «the pyrolysis process, used within RusVinyl integrated complex, is characterized by high technological performance, application of effective schemes of automatic control and regulation of operating procedure that allows, furthermore, to reduce natural gas consumption, to minimize coke forming and to prolong the interrepair period for furnaces work». Currently, 369 units of equipment, including oversized and heavy facilities have been already installed at the production zones. The overall project progress, including engineering, procurement, and construction is about 74%. “In our region we are forming a petrochemical cluster which will include Dzerzhinsk and Kstovo industrial facilities. We have all the grounds to believe that it`s RusVinyl PVC production complexthat will become one of the key plants of the cluster”, - summed up Valeriy Shantsev after having finished the construction site inspection. Also the governor hold at place a short working meeting where he heard RusVinyl management reports concerning the construction progress and the implementation status of infrastructure projects.